Booking a flight into St. Pete-Clearwater International Airport is one of the best ways to plan for a relaxing vacation in the St Petersburg area. Although Tampa has a larger international airport with a greater number of daily flights, any difference in price or flight schedule will be negated by time and expense of traveling from Tampa to St Petersburg. Booking a flight into St. Pete-Clearwater International Airport is one of the best ways to plan for a relaxing vacation in the St Petersburg area. Although Tampa has a larger international airport with a greater number of daily flights, any difference in price or flight schedule will be negated by time and expense of traveling from Tampa to St Petersburg. If you are looking to relax on on the white sand beaches of St Petersburg as soon as possible, make sure you fly into St Petersburg, Clearwater International Airport. Small Town Feel Almost everyone that flies in and out of St. Pete-Clearwater International Airport (airport code "PIE") is struck by the friendly, small town cheer, that is in the air. Parking is ample, and there tends to be enough TSA agents to make the security lines move quickly. In 2013 PIE received just over 1 million passengers, which represents a 17% over the prior year. As the domestic economy continue to improve, one can expect those numbers to continue to grow. Traffic at PIE tends to match the overall visitor patterns for St Petersburg, as well as the St Petersburg weather patterns. The slowest months at PIE are August, September and January, while the busiest times are December, March and June. 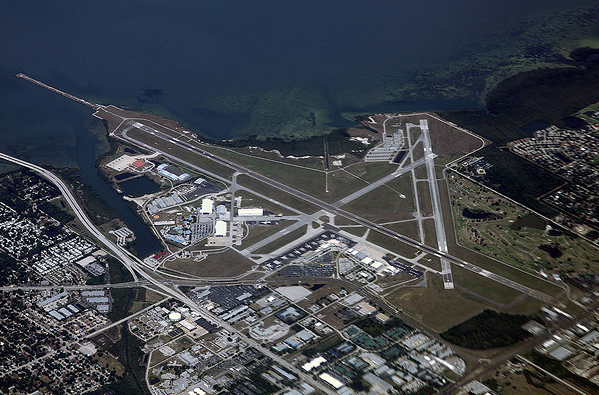 What Cities Offer Direct Flights to St. Pete-Clearwater International Airport? The list of cities offering non-stop flights to St. Petersburg, Florida includes: Allentown, PA Asheville, NC Bangor, ME Cedar Rapids, IA Chattanooga, TN Rickenbacker/Columbus, OH Des Moines, IA Elmira/Corning, NY Fargo, ND Ft. Wayne, IN Harrisburg, PA Huntington, WV Grand Rapids, MI Greensboro, NC Greenville-Spartanburg, SC Knoxville, TN Lexington, KY Moline, IL Niagara Falls/Buffalo, NY Peoria, IL Plattsburgh, NY Roanoke, VA Rockford, IL Sioux Falls, SD South Bend, IN Springfield, MO Stewart/Newburgh, NY Syracuse, NY Toledo, OH Tri-Cities, TN Youngstown-Warren, OH Toronto, Canada Halifax, Canada Is There Enough Parking? There are a number of parking options at PIE. These include: Short Term Parking: $2.00 First Hour, $1.00 each additional 20 minutes, $14.00 Daily Maximum. Long Term Parking: $2.00 First Hour, $1.00 each additional 20 minutes, $11.00 Daily Maximum, $77.00 Weekly Fee. During peak operations the airport will open another long term lot to meet the demand. The cost is $8 per day. What If I am Delayed at St. Pete-Clearwater International Airport? Are There Any restaurants? There are a number of shops and restaurants at PIE to enjoy in case your flight is unfortunately delayed. Sam Adams Grille is open to all visitors to the airport, offering views of Tampa Bay and airport activity. Located on the second level, the restaurant features an American Bistro menu serving breakfast, lunch, and dinner. A full-service sit-down dining room features specialty sandwiches, steaks and seafood. Also located on the 2nd floor is the Sam Adams Pub, which offers full bar service to patrons 21 years of age and older. The Tampa Bay Café and Bar is located post security in the Departure Gate 2-6 passenger hold rooms. Deli sandwiches, paninis, and wraps are prepared to order, and a convenient "grab and go" selection is available for on-board enjoyment. The Sam Adams Bar, offers a great selection of beer, wine, and premium liquors while you watch your favorite sports game. Shell Key Café, in Departure Gates 7-10, offers fresh coffee, pastries, breakfast/deli sandwiches, and salads. Beer, wine, and liquor are also available.